I'd always been curious about the global juggernaut restaurant/lounge/nightlife brand that is Hakkasan. 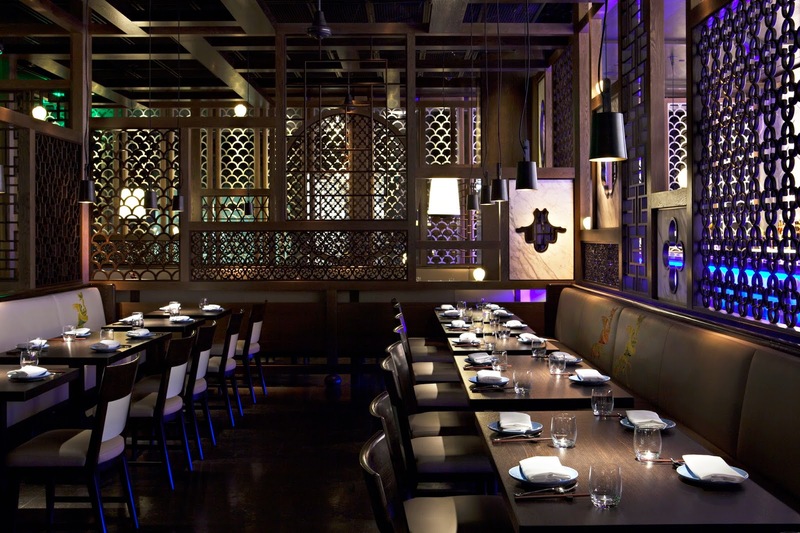 Originating in London, with Singaporean Executive Chef Tong Chee Hwee at the helm, Hakkasan had earned a Michelin-star within a year of opening. 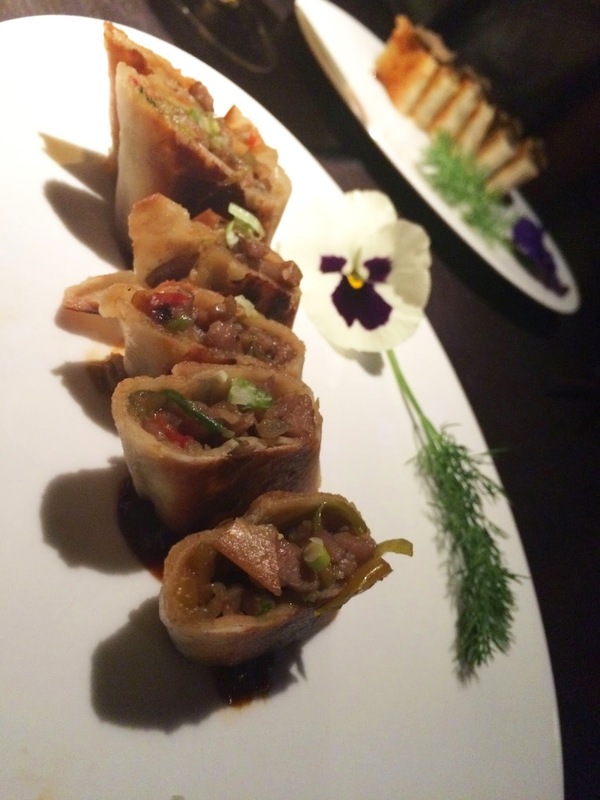 A Chinese New Year menu tasting at Hakkasan's Beverly Hills location gave me the occasion to finally check the place out. The ultra-lounge ambience has a Chinese flare, with ornate, airy screens inspired by traditional interior design helping to section off tables so that you get a sense of the expansiveness of the place while enjoying a degree of privacy with your dining companions. As a fan and supporter of Chinese 'experience' restaurants - gastronomic temples balancing fine dining traditional / inventive Chinese with modern, chic decor is de rigeur in Hong Kong - the ambiance really does add to your enjoyment of the meal. Elevated Asian food in experience restaurants is often met with skepticism in the US, and while I had my reservations as well, I tried to keep an open mind. From the CNY menu (see full listings at bottom), there was one huge standout for me: the Golden fried sea prawns dish, with red chili and curry leaf. The prawns were the perfect size, with a fragrant spicy-salty crispy crunch yielding to plump and juicy with a pleasant spring: best of all they were heaped with a giant mound of fried egg YOLK wisps, also with just the right amount of heat and umami to make them something you won't be able to stop eating. I was surprised at how much I loved this dish - If they sold a giant gallon tub of even just those egg yolk wisps, I would happily squirrel and devour them by fistfuls. Right now this dish is only being offered as part of the CNY menu, but I'm hoping they will decide to add it to the regular a la carte menu - it drew unanimous raves from everyone at our tasting, and is definitely a dish I would come back for. Cost: $138.88, minimum of two people to participate in the menu. To complete the dining experience, the Kumquat wishing tree dessert consists of two parts: a chocolate kumquat dish with dramatic plating: a tree silhouette is painted in chocolate on the plate, with bright orange bursts of kumquat sorbet accompanying chocolate cake on top. The second part is a futuristic looking plastic tree hung with edible candied kumquats. This second tree comes with a red 'wishing slip' that you can write your wish on - a global community element then comes in the form of encouraging guests to share their written wish with others via social media. Most dishes were tasty, but I did particularly wish for the fried rice to have more 'wok air'. Even if the dish is meant to be served 'wet' style, the rice should have had more 'fragrance release'. 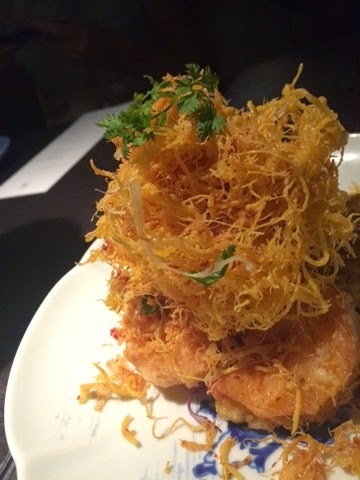 We did not get to try the dim sum nor the spicy prawn, and I hope to go back soon to check them out and get a more complete picture of Hakkasan's offerings. In the meantime, here's to wishing everyone a happy Chinese New Year! My philosophy has been: what is the point in living, if you're not actually going to live? I use it shamelessly to indulge in whatever I want, in terms of food, and sometimes in life in general. We all have a finite time here. To me, it's pointless to try to do everything you can to prolong life, if my life would consist of abstaining from all that makes life enjoyable, and constraining myself to flavorless dry meat and/or saltless/textureless plants, and sacrificing every free moment I have to be in the gym in endless repetitions of repetitions, day, week, year in and out. But of course, you still have to do something to enable yourself to keep going, you know, with the indulgence. System breakdown would not be good either. So it's fantastic when I come across that rare edible that is tasty FIRST, and healthy as a secondary benefit. With thankfully tasty cold pressed juice as my 'gateway drug' to healthy alternatives, I was excited to come across Kreation Organic in Toluca Lake recently. Their tiny storefront is to healthy drinkers / eaters, like a candy store is to sugar addicts. Not only do they have a big selection of refreshing organic, cold pressed juice blends - some with fun names like 50 Shades of Green - they also have tonics as 'shots' that you can take for various concerns like Sleep or Decongestant (I love that they are labelled for their function, so you can pick up the right 'natural cure' accordingly without holding up the line with a lengthy consultation with the storekeeper). But, beyond all this, my favorite 'discovery' (that probably everyone who eats healthy has already known about for, forever) is their Amazebowls. These are so packed with fresh, perfectly ripe fruits and so skillfully balanced with just the right amount of housemade, perfectly crunchy granola - that you forget that they are also the much overused phrase that has become unfortunately 'trendy' and often associated (for people who don't actually have medically diagnosed food allergies) with food-fussiness, and anathema to foodies (who don't have diagnosed food allergies): gluten-free. The Amazon bowl is my favorite so far: it's made of blended acai juice, banana, blueberries, raspberries, strawberries, almond butter, topped with apple, bee pollen, raw honey, strawberries, bananas, and gluten free granola. It tastes like a happy, lucky farmer with access to perfectly ripened fruits plucked them from his backyard, put them in a bowl, which he then places under some gorgeous flowers and shook them to dust it with bee pollen, and toasted up some fresh oats to sprinkle on top. Açaí, for those unfamiliar, is a berry from a palm tree found in Amazonian rainforests. It's delicious: a flavor-forward fruit that tastes like blackberries with a hint of raspberry and dark chocolate. And it's gained fame as a superfood as it's rich with antioxidants, amino acids and essential fatty acids. Bee pollen is the second superfood, which adds a clean, lovely crunch to this juicy bowl: it's packed with proteins, free amino acids, and vitamins including B-complex and folic acid. Apparently if you took some bee pollen and put it next to beef, eggs, or cheese of the same weight, the bee pollen would beat all of those foods in amount of amino acids. Textures and flavors are well balanced, and at a VERY generous serving that will fill you as either a mid-morning snack or even lunch, at $9.95 (think about how much organic fruit / superfruit you are getting in the bowl for that price!). And yes, for those who care: there are still a lot of natural fruit sugars - but it's definitely a much better alternative to processed cereals, pastries, energy bars or any foods along those lines that you might have eaten instead. I love it for being good for me, without me having to 'give up' anything. I actually find myself craving the Amazon Amazebowl, and have already decided that this will be part of my new routine, after workouts that I enjoy (e.g. BarWorks / Sculptworks), to get my fix at Kreation Organic.